Betal narrated another story while Vikram was carrying him. Once, there lived a gang of robbers in a forest. Their leader was Ugrasen, who was very cruel. They used to loot the nearby villages. After some years, Ugrasen's wife gave birth to a baby boy. Ugrasen loved him very much and played with him all the time. Slowly his heart began to soften. One night, he dreamt that the King's soldiers had killed him and his son was orphaned. When he woke up he was reformed and decided to surrender. The other dacoits did not like this idea and threatened to kill his wife and son. Ugrasen fled with his wife and son and went to the king. The king forgave him. 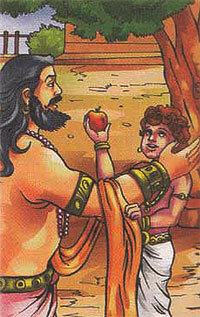 Betal asked Vikram, "Was the king right in forgiving Ugrasen?" Vikram replied, "Yes, Ugrasen had surrendered on his own. This shows that he was reformed." Betal heard this and flew away since once again, Vikram had spoken aloud.